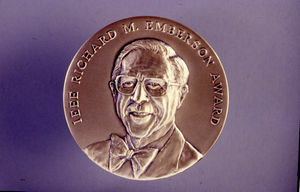 In 1986 the Board of Directors established the IEEE Richard M. Emberson Award. The Award is named in honor of Dr. Richard M. Emberson, whose 23-year association with the Institute at both the staff and volunteer levels, including Director of Technical Services, Executive Director and General Manager, and Member of the Board of Directors, exemplified loyal and dedicated service to the Institute, especially its Technical Activities. This page was last edited on 1 February 2019, at 15:46.